Updated 8/05/09. Added browser view of GPS trace of the course. Uses Google Earth plugin. Updated 8/20/08. Added Split Rank listings (PDF) for 2007 50K and 50M, and related comments. Winding down the precipitous Mt. Wilson road, I thought about the run ahead. To my left granite and pine glowed golden in the morning sun, and to my right the mountain plunged in long shadows, 2000′ into the canyon of the West Fork San Gabriel River. In a few hours I would be somewhere down in that canyon, plodding along sun-baked Red Box road. By then the temperature would be in the mid-eighties, but in the full sun it would feel like a hundred. That would be around mile 23. I kicked a pebble and winced as it almost hit the heel of the runner in front of me. Only at mile 1-something, there were a lot of miles to go. This was the fourth running of the Mt. Disappointment 50K, and my fourth as well. If ever a race route mirrored the character of its organizer, the Mt. Disappointment Endurance Runs reflect the tough and tenacious character of race director Gary Hilliard. Starting and ending near the summit of 5710′ Mt. Wilson, the figure-8 50K course is a challenging mix of mostly single track trails and dirt roads with an honest 5800′ of elevation gain/loss. A very difficult 50 mile option was added in 2007, and is a favorite of runners training for the Angeles Crest 100. Nearly half (44%) of the 5800′ of elevation gain is in the last 5.3 miles of the 31.5 mile race! Did you push the downhills too hard? Not eat enough? Electrolytes low? Whatever miscalculations have been made earlier in the race will be rung up here — ka-ching! The runner that has nothing left for this climb can take hours to complete it. One possible gotcha is that 8.6 miles of the first 11 miles are downhill, and it is very difficult to resist being swept along by gravity and the crowd. The early enthusiasm of surrounding runners is contagious. In 2007, I pushed the pace to Clear Creek too hard, and bonked on the backside of Strawberry Peak. I could barely run. The uphill stretch on the Strawberry Trail to Lawlor Saddle seemed to go on forever, and even the downhill to Red Box was hard to run. I didn’t see how I could finish the race. How bad did it get? Out of curiosity I used the splits from the 2007 race to calculate each runner’s rank at each aid station, as well as their time between each aid station. At Clear Creek my rank was 58th, and by Red Box it had blossomed to 82nd. That means between Clear Creek and Red Box I was passed (and encouraged) by 24 runners. Here are the calculated 2007 50K Split Ranks and the 2007 50M Split Ranks. Some splits were missing and had to be estimated — these could be wildly inaccurate. I did finish, but it wasn’t fun. This year I was determined not to repeat that experience. The plan was to be about 10 minutes slower at the Clear Creek aid station; gain back that time, and more, by Red Box (Aid #3); run the Red Box Rd. segment in about an hour; and then do the final climb back to Mt. Wilson in about 1:40. That would put me closer to my 2005 and 2006 times. Here are some notes from along the way. Times are from aid station to aid station, and are approximate. Overall, my time was 27 minutes faster than in 2007. But that’s just a figure on paper and doesn’t begin to describe how much better I felt during the race, and how much more I enjoyed it. Start slow, start slow, START SLOW is an ultrarunning adage we all know, but in the fervor of race it is often one of the first maxims that is forgotten. Again this year, Gary Hilliard and crew made sure everything was just so — trails, aid, awards, finish line food, 2000 lbs. of ice, Brooks t-shirt, goody bag and more. Always an adventure, the Mt. Disappointment 50K is a trail running classic. Many thanks to all that make it happen! Here’s a Google Earth image, Google Earth KMZ file, and Google Earth browser view of a GPS trace of the course, with mile splits generated by SportTracks. In Google Earth, click on the red icon for the split time, pace and elevation change. 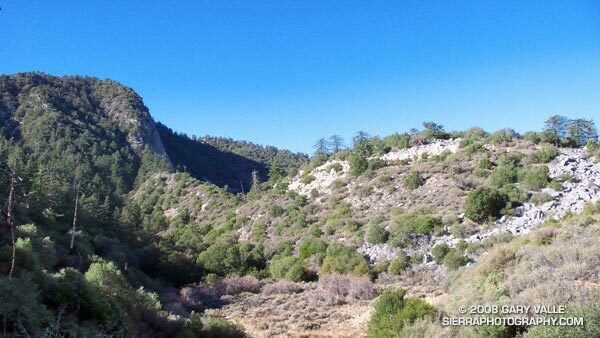 The title photograph was taken at about mile 17.5 on the course, just past the junction of the Strawberry and Colby Canyon trails, and is looking back at the terrain traversed by the Colby Canyon Trail on the north side of Strawberry Peak. It is from November 2007. P.S. About 20 minutes after I finished the 50K, Jorge Pacheco completed the 50 mile race in an astounding 7:41, crushing the course record he set last year by almost 45 minutes! Full results are posted on the Mt. Disappointment Endurance Runs web site.